While we've no clue how widespread AT&T's generosity is, or how you might get one, it appears that the company's "most valuable customers" are now receiving free range-boosting femtocells. 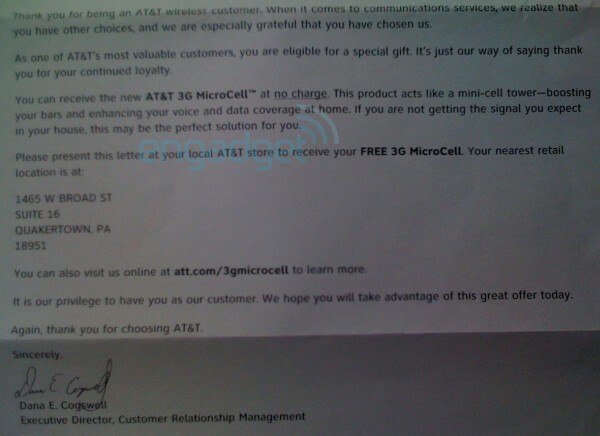 Today, loyal reader Jason got a old-fashioned paper letter in the mail, offering his iPhone-wielding family a 3G MicroCell with no strings attached. Driving down to the local AT&T store, he got the product, but the dumbfounded reps offered no explanation why. Though his calls do frequently drop at home, Jason says he wasn't terribly vocal about the issue and only pays around $180 per month for his family plan -- the only thing that might possibly qualify him, in his opinion, is that his contract was set to expire. We've reached out to AT&T for more information; in the meanwhile, see Jason's letter after the break. Update: We're being told that AT&T is currently in the process of trialling different ways of offering the MicroCell, which is why a handful of customers have received this letter. We suspect you're always going to get positive reactions when you're offering something for free... but maybe we're crazy.